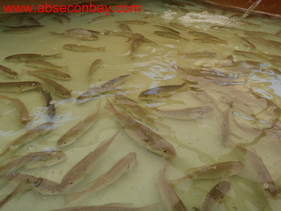 Listed are all usual stocked baits. All prices may change depending on availability. If you need a specific bait, I'll probably have it, but please call to confirm. Gone for now, but they will be BACK! 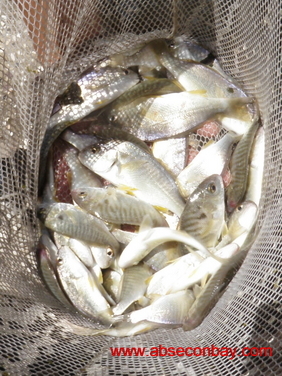 Live Spot is one of the most effective Live Baits for Striped Bass and in the smaller sizes everything eats them, particularly Keeper Summer Flounder and Weakfish. South Jersey is normally the northern part of their range so they usually have to be transported from Maryland or Virginia, either from the Chesapeake Bay or the Atlantic coast regions. I expect my suppliers to start hauling them as soon as the Maryland Crabbers start finding them in their traps. Last Season local SPOT were almost non existant so all my SPOT were brought from the south. I keep them in tanks and they are fed commercial fish food concentrate and I feel they are the healthiest Spot you will find anywhere. 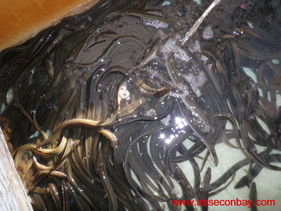 Eels are one of the very best Striped Bass Baits and work year round especially at night. I keep them all year long, but sell the most during the Fall Striper Season. Lately since introducing SPOT as live bait there has been less night fishing for Stripers, but Live-Lining an Eel thru the rips at night is an excitement that you shouldn't miss. I currently am overwintering a good number of eels, if all goes well I should have a good supply when the Striped Bass season opens March 1st. 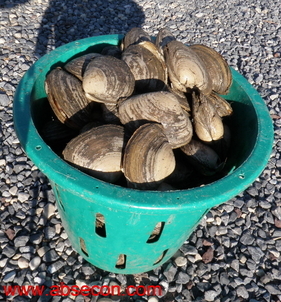 If you want the very best chance to bring home a Striper, there is no better bait than the lowly Surf Clam. Just find a fishy looking spot, drop the anchor, put a big glob of clam on a 8/0 hook, and drop it to the bottom. Most likely a big ole' Bass will inhale it and you're hooked up. Yes there are some details to learn, but you can go out on your own and catch stripers if they are in the area. $.60 each, $6.00 a dozen, $25.00 a 4 gallon bucket, $30.00 a 5 gallon bucket, $50.00 a full bushel. If you are looking for something to really grab a Stripers attention, Fresh Bunker will really do the trick. Unfortunately it is sometimes hard to come by and harder to keep if I find it. Price can vary by supply and demand, but usually I sell them at about $2.00 a fish. This is one bait that you should call ahead to confirm availability. Bunker in it's juvenile form are called Peanuts, and all species of fish eat them like peanuts. When they are in our estuaries and tidal creeks they are relatively easy to catch. They are rather fragile and take care and an areator to keep alive. I don not find dead peanuts an effective bait and I do not bother to stock them Fresh or Frozen. Once the main bodies of peanuts leave the creeks they do become difficult to obtain and I do ty to keep my tanks full, the price will go up but they are still an inexpensive alternative to the pricey SPOT and if the scoolies are thick they will give you action at a reasonable price. It looks like this season was the worst Mullet run in recent history. I personally have not been able to catch a supply to fill the tanks and Fresh Mullet weren't even available for purchase. I will have frozen mullet available as possible thru the season. These great baits are just bite sized for big stripers and are one of their favorite foods. I cast net them myself in the back bay and on the beach front. They are harder to keep in pens than spot and they wil only last until the first serious cold snap. When the run is over the prices will go up. 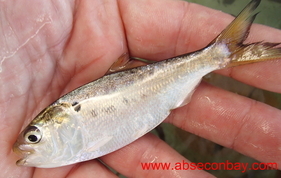 One great advantage to Finger Mullet is that they are extremely good as frozen baits. I stockpiled plenty last fall during the run and have them available even for the Spring Run. They can be used in the Surf, Back Bays and in the Rivers and will seldom be refused. I don't know if it is their oily smell or what, but they attract every kind of Gamefish. There really isn't anything better for the early cold water bluefish that invade our local waters. For monster Fluke you really should give the frozen mullet a try. $10.00 a Pint, $7.00 1/2 Pint, Summer prices change due to supply and demand. 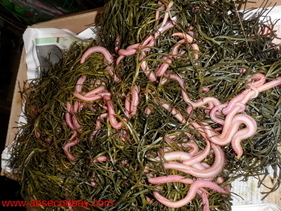 These ugly little critters are probably the most expensive seafood outside Japan... and we feed them to the fish. Because they work. Almost everything will gulp down a piece of bloodworm, or go for the gusto and put a whole one on the hook for a striper. For salt and brackish water panfish nothing else even comes close. I keep them in stock all the time, but I do not catch them, they are dug in Maine and Maritime Canada and every box is different. I have good suppliers so I usually have good worms. If you are fishing for Tog there is really only one bait to use. Green crabs are just about the only commercially available bait and I keep them Live in my Tanks whenever the season is open. However when the limit is only one fish I only sell them by the dozen. When the season opens up in November i will have volume pricing by the Gallon or Bucket full. Current Price $4 a Dozen.